The release of the June 2014 jobs numbers this morning marked the five-year anniversary of the official end of the recession (and start of the recovery) in June 2009, making this a reasonable time to address one of the persistent myths of this recovery—that the jobs recovery has been weak because of a “skills mismatch,” whereby workers do not have the skills they need for the jobs that are available. This brief commentary provides an in-depth look at this issue, but the unemployment numbers released today also provide good information. In an update to this post, the table below shows the June unemployment rate, the unemployment rate in 2007, and the ratio of the two, for a variety of demographic categories and by occupation and industry. We see that while (as per usual) there is considerable variation in unemployment rates across groups, the unemployment rate is substantially higher now than it was before the recession started for all groups. The unemployment rate is between 1.2 and 1.7 times as high now as it was seven years ago for all age, education, occupation, industry, gender, and racial and ethnic groups. 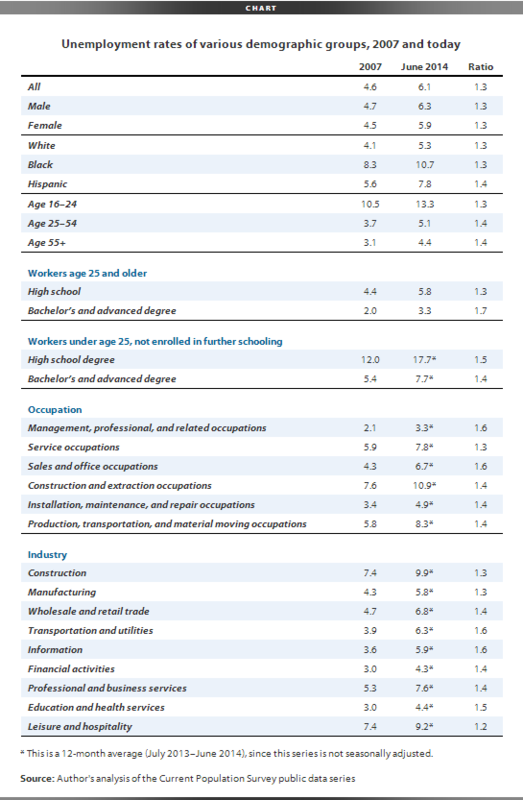 Elevated unemployment across the board, like we see today, means that the weak labor market is due to employers not seeing demand for their goods and services pick up in a way that would require them to significantly ramp up hiring, not workers lacking the right skills or education for the occupations or industries where jobs are available.